We have a super busy week this week, and I am really kind of bummed because we got a new grill this weekend and it doesn't look like it is going to get put together or even used until next week. Monday-JLM friend over to work on slideshow for tomorrow nights end of year meeting. We will be having bean soup that my mom made with grilled cheese sandwiches. Pretty exciting stuff! Wednesday-"Angels and Demons" screening, we have already decided to grab something to eat at PF Changs, I am craving some lettuce wraps. Thursday-Monthly Pint at Park Tavern so basically beer, bowling and bar food, but I know it will be a lot of fun. Friday-Dinner out, the boy and I are just going to take the weekend to ourselves and enjoy! Saturday-Most likely dinner out or pizza ordered in, unless I get rambunctious. But I have some serious items to cross off of my "ta-da" list this weekend, and I need to get crackin' on it! Sunday-Back to my house to grill finally. I am thinking steaks, but will post a recap next Monday. 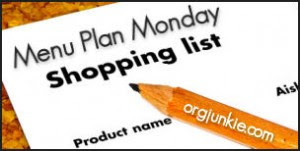 I am going to get better about organizing and planning my meals, I do have a ton of stuff that I would like to make. It is all about timing! As always, check out more meal plan ideas over at Orgjunkie.com.